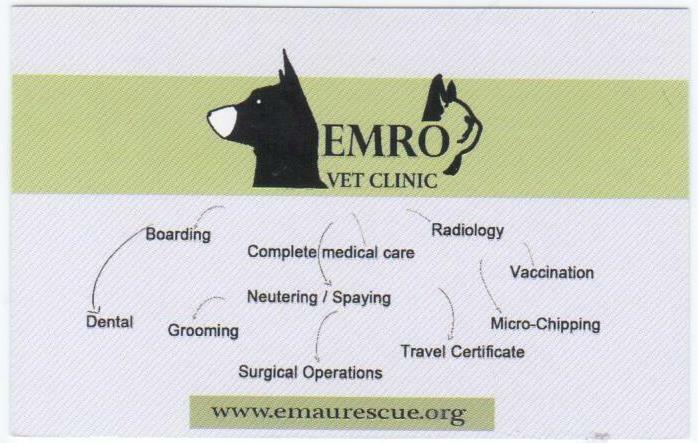 Welcome to EMRO's Vet Clinic! Operating since summer 2007, EMRO has employed a team of Veterinarians at the EMRO Vet Clinic who provide full-time vet services to the EMRO cats, as well as to the surrounding community. Our Veterinarians normally work two shifts daily, from 10:00 AM to 4:00 PM, and 4:00 PM to 10:00 PM (10:00-10:00 daily coverage). 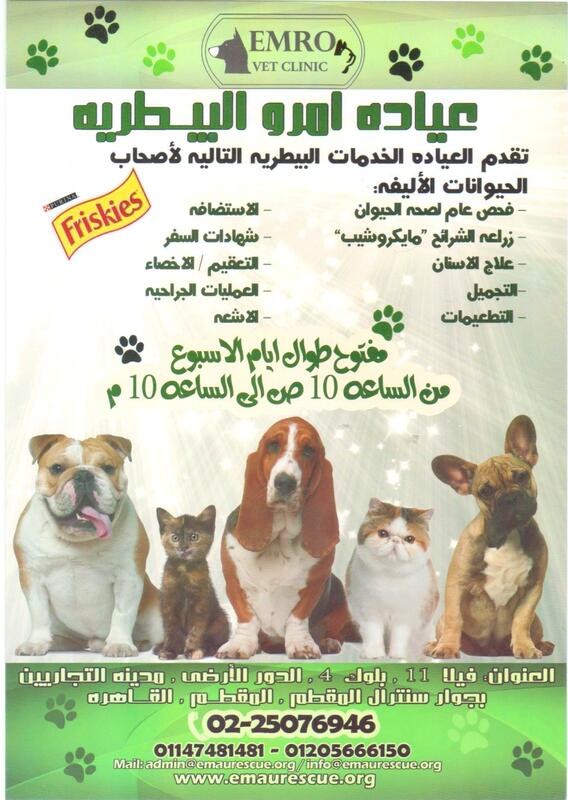 Our current Veterinarians include: Dr. Hazem Sheriff (Assistant Manager), Dr. Mahmoud, and training veterinarians. 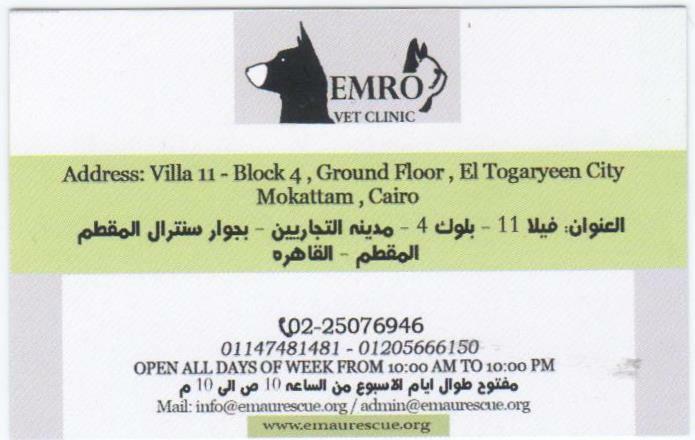 Mr. Hamido is in charge of EMRO’s Animal Handlers and is Chief Groomer. Usually, one or more of the animal handlers remains overnight. Our Shelter and Office Manager is Mr. Mostafa Nagy. We only have one part-time Administrator, Ms. Orchid. EMRO can now provide services of an X-ray Mini-lab. This very-welcomed piece of equipment will allow our vets to view possible internal injuries sustained by an animal before it is necessary to operate. EMRO’s Vet Services provide full medical services for your small animal pets (dogs and cats): Operations (spay, neuter, eye, and other), Vaccinations (combo and rabies), Wound care, Deworming, Ear mite and Ringworm treatments. General examinations are available along with Teeth Cleaning, Grooming, Travel Certification for pets leaving the country, Microchips, Diet recommendations, as well as FIV/FeLV testing and Rabies blood testing (for E.U. and UK countries). Medical advice for other animals are available as well. Limited home visits in Mokattam are also available at competitive prices. Discounts, such as for initial visits from adopted shelter cats, may also available. Boarding is available at the shelter, as well as isolation quarters for any pet suffering ringworm, ear mites, etc., and/or requiring regular short-term treatment. For more information on hours, rates, and location, please contact the EMRO HQ office in Al Mokattam, Cairo: +202-2507-6946. 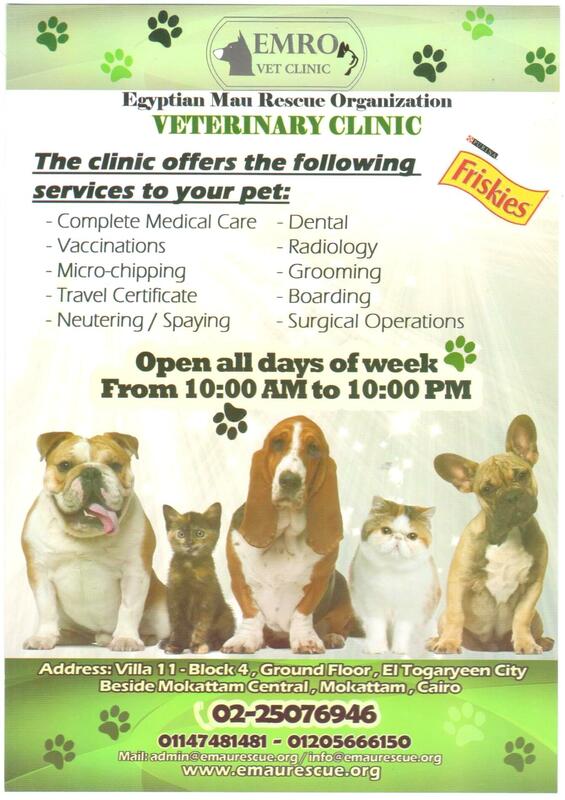 The EMRO Veterinarian Clinic is open 7 days a week, with expanded hours of 10:00 AM to 10:00 PM, daily. Left to Right: Front door of EMRO leading to HQ office and vet clinic. Note stray cat (half Mau) awaiting supper! Middle: EMRO building, where the clinic and HQ are on the bottom (main) floor. Boarding is also on the first floor. EMRO's larger sign in front of building. Right: EMRO's new sign, larger view, as of 2014. 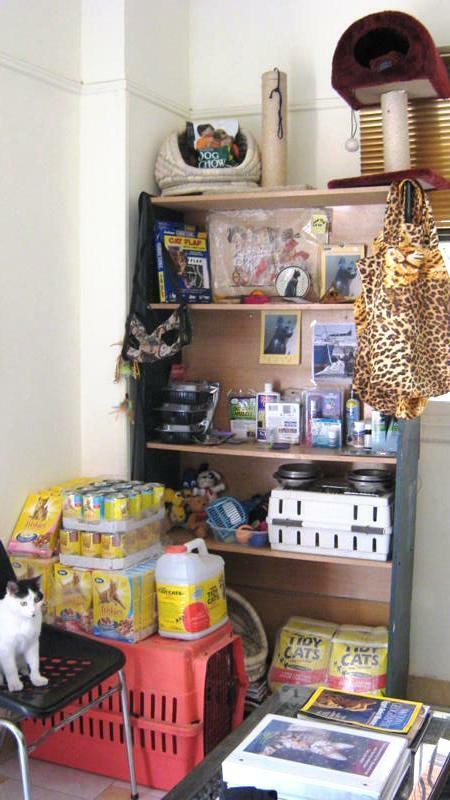 At the EMRO Pet Shop store, located in the shelter/clinic office, customers may find such items as Tidy Cat Kitty Litter, cat baskets, cat toys, cat carriers, book, cat chow, dog chow, and many other items for your pets at a competitive price. (Please Note: Currently, and due to the state of affiars in Egypt, the supplies are quite limited. Check with EMRO about supplies available).